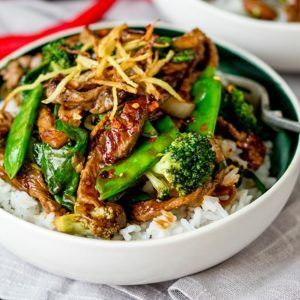 Ginger Beef Stir Fry – fried up with ginger and garlic, and served with lots of green veg in a sweet and savoury Chinese sauce. The whole thing is finished with crispy ginger shoestring fries and a sprinkling of chilli flakes. So so good. Have you ever tried crispy ginger root – fried up like little matchstick fries? Now they will really get your taste buds tingling! Crunchy and moreish, with all of that lovely ginger heat. I thought they’d make the perfect topping for my ginger beef stir fry. Before we get on with the recipe – lets just talk beef. 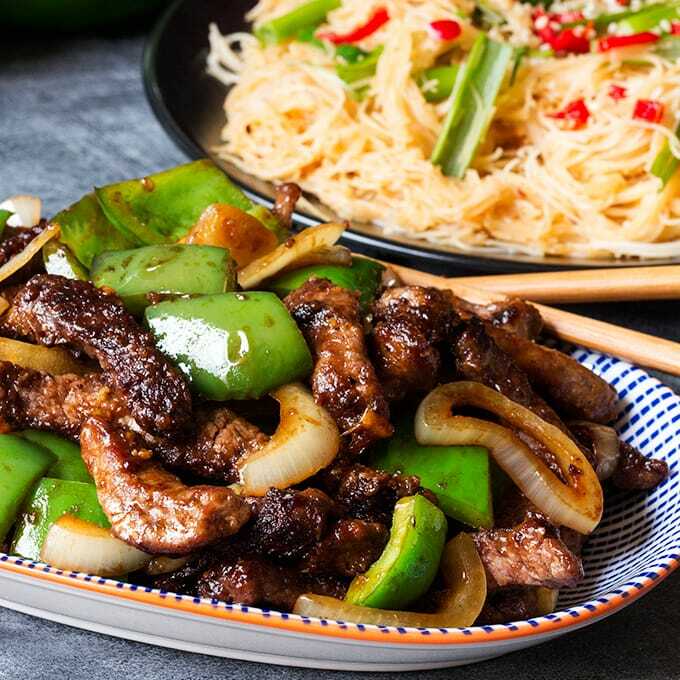 I’ve made plenty of beef stir fries in my time where the beef ended up chewy because I’d be using a cheaper cut or trying to slice it into big chunks. 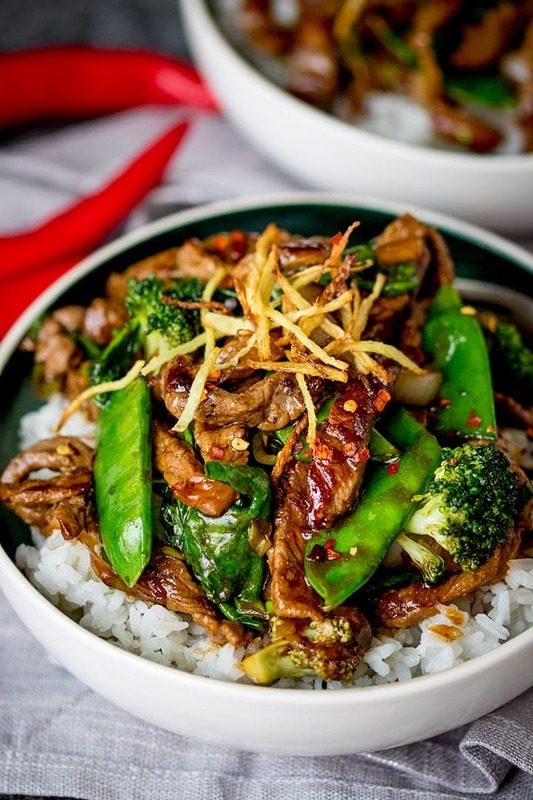 Trust me, thinly sliced sirloin makes the best stir fry ever! It’s even easier to slice thinly if you place the steak in the freezer for 30 minutes to firm it up first. Use a really sharp knife, and make sure the oil you’re frying it in is really hot. Start by thinly slicing sirloin steak. Then peel some fresh garlic. Chef’s Tip: The skin comes of easily if peeling with a teaspoon. 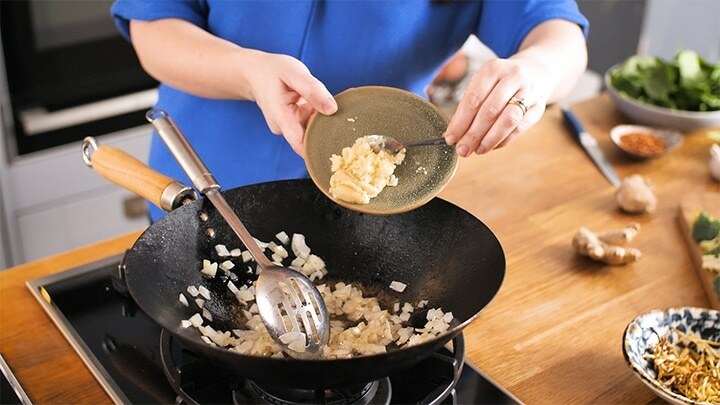 Slice the garlic into thin strips, then fry in oil in the wok until crispy. 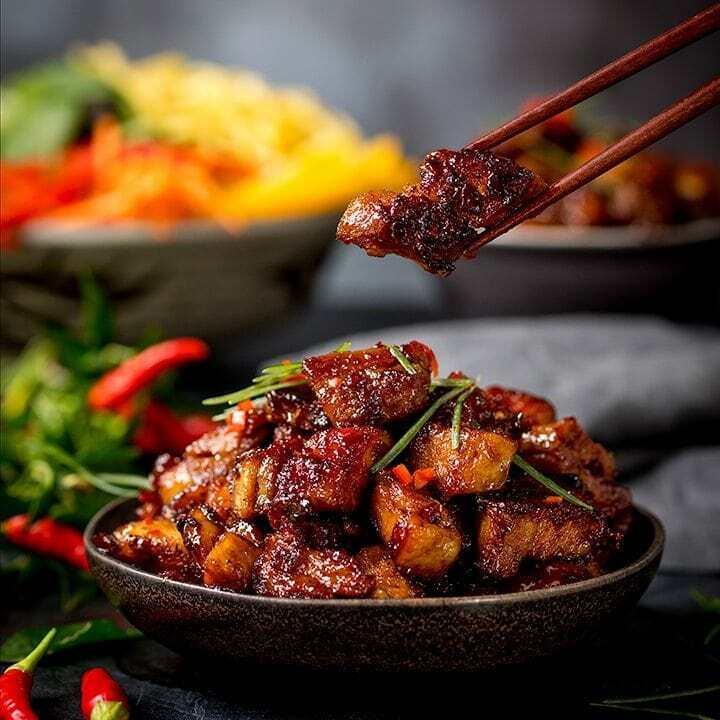 Next make the sauce – mix together brown sugar, soy sauce, Oyster sauce and rice wine. 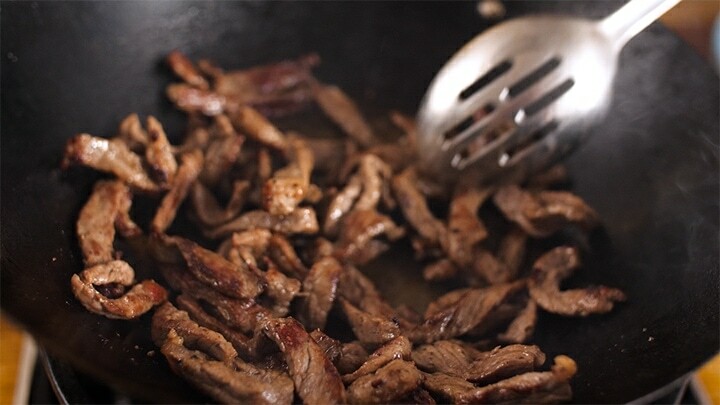 Fry the seasoned strips of steak in the wok, then remove from the wok. Fry onions in the wok, then add ginger and garlic. Add green veg next – I’m using mangetout (snow peas), broccoli and spring onions (scallions). Add the sauce and bring to the boil. Let it bubble for a few minutes to reduce and thicken. Then add the steak back in. Add a couple of handfuls of fresh baby spinach. And stir everything together to heat through. Sweet, spicy, crunchy and totally delicious!! 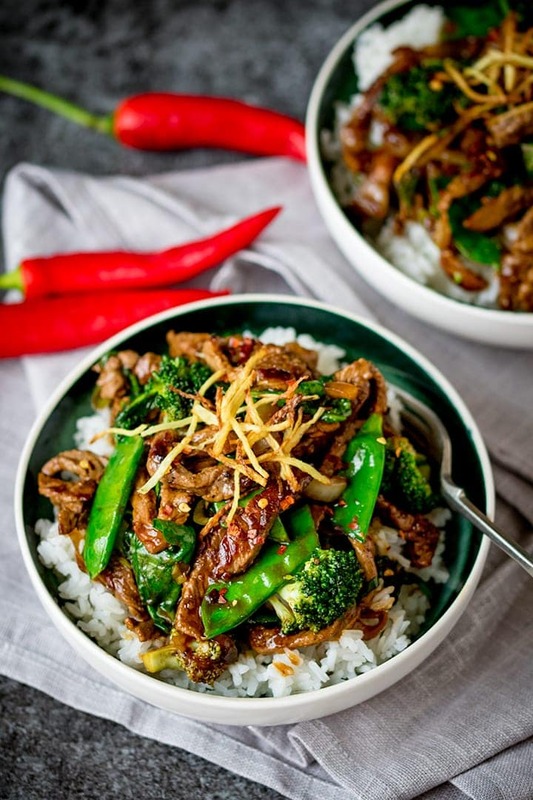 Spicy Ginger Beef stir fry - tender beef sirloin with crispy ginger, green veg and a simple-but-tasty Chinese-inspired sauce. Freeze the beef sirloin for 30 minutes so that it’s firm but not completely rock-solid-frozen. Slice into thin slices across the grain. 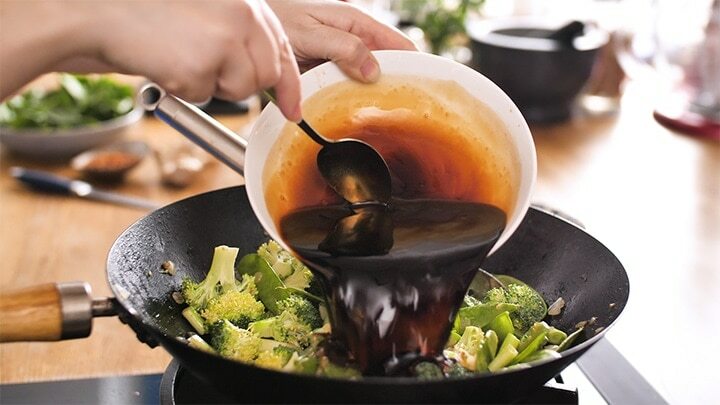 Heat the oil until shimmering hot in a wok or large high-sided frying pan. Add the ginger that’s been cut into matchsticks and fry for 2-3 minutes until golden and crispy. Scoop out of the pan with a slotted spoon and leave to drain on some kitchen paper. Carefully spoon out all but 1 tbsp of the oil (reserving the oil). Bring the temperature back to very hot again. 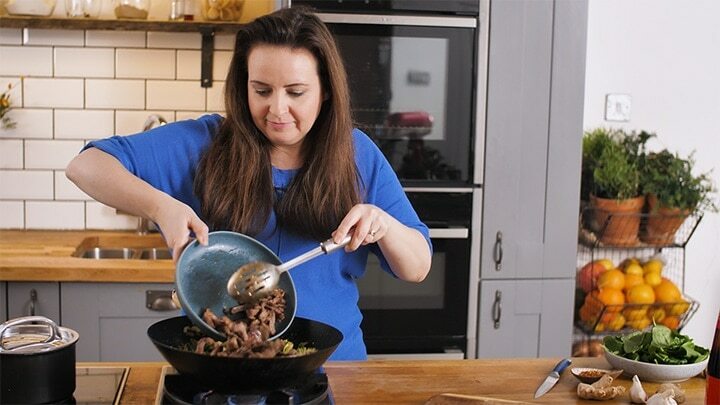 Sprinkle the salt and pepper on the beef and and add half the beef to the wok. Fry, moving around a few times until browned (about 3-5 minutes). Spoon out with a slotted spoon and place in a bowl to rest. Add in another 1 tbsp of the oil if needed and cook the remaining beef in the same way, then place in the bowl too. Add a little more oil if needed so you have around 2 tbsp of oil in the wok. Heat to a medium heat and add in the chopped onion. Fry for 2-3 minutes until just starting to soften. 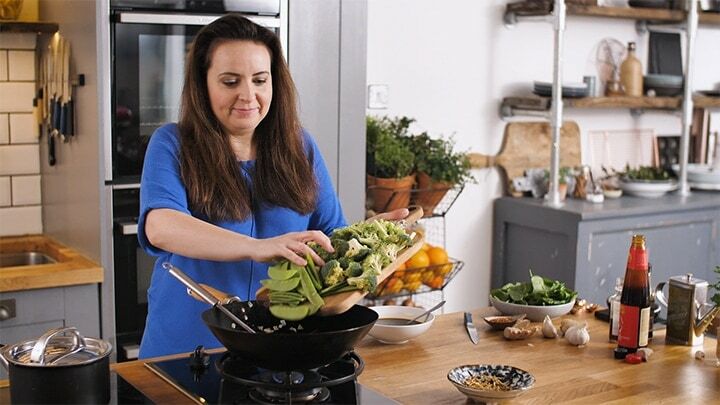 Add in the minced ginger and garlic and fry for a further 30 seconds, then add in the broccoli, spring onions and mangetout. 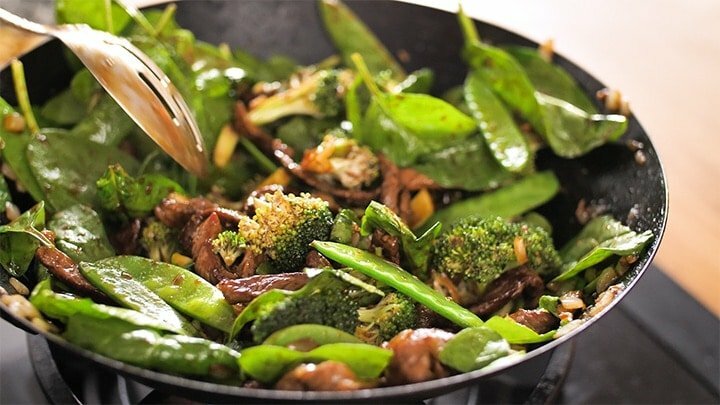 Stir fry for one minute, then mix together the sauce ingredients and add to the wok. Allow to bubble and thicken for one minute, then add the beef back in. 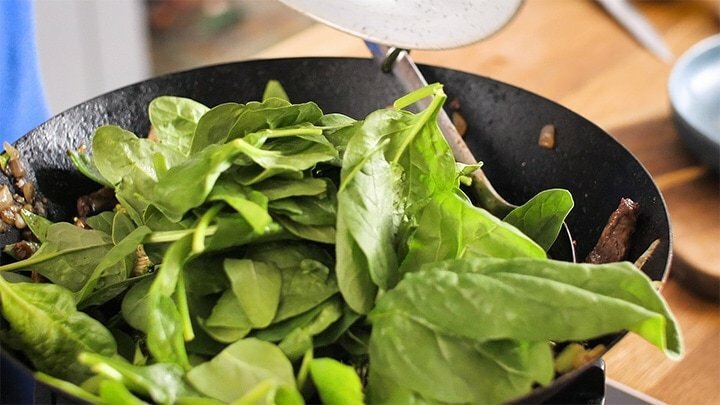 Allow to heat through for a minute or two, then stir in the spinach and turn off the heat. 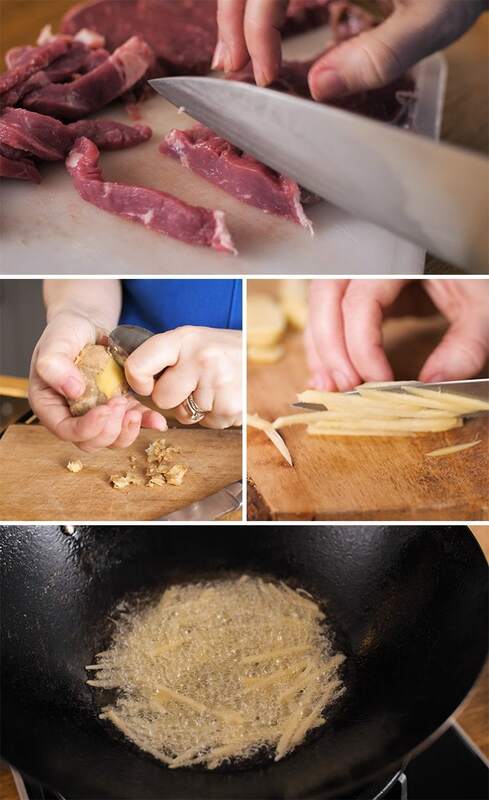 Sirloin is the best cut to use for this stir fry as it's tender and tasty and holds up well to being quickly fried. Flat iron, tenderloin and rib eye are good swaps if you want to use a different cut. Place the steak in the freezer for 30 minutes before slicing. This will make it firmer, enabling you to slice the steak in thinner slices. Use a teaspoon to scrap the skin off the ginger. It's easier and you get less waste this way. 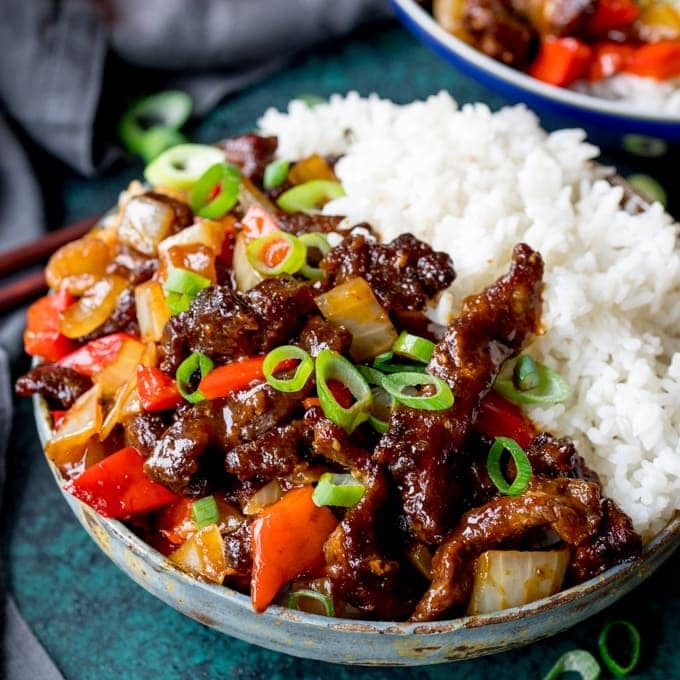 Can I make ginger beef stir fry gluten free? Yes, replace the soy sauce with tamari. I would use 4 tbsp of tamari instead of 5 as I find it can be a little overpowering. Rice wine sometimes contains gluten - so check your brand. You can replace with a splash of sherry. 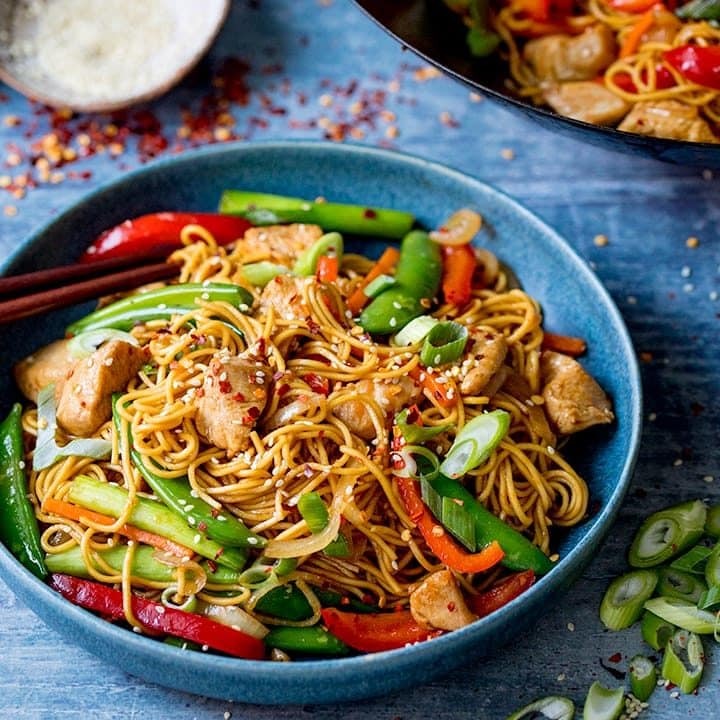 This stir fry tastes best when made right before serving. Yes, replace the steak with a meat-free alternative such as tofu, quorn or some thickly chopped mushrooms, or you can leave out entirely. Nutritional Information is per serving, without serving suggestion of boiled rice or noodles. This post was first published in August 2016. Updated in February 2019 with video, step-by-step photos and extra tips. I forgot to add the brown sugar, an it was fantastic! So tasty and crunchy. Hi, just made it tonight 18/03/18 was really nice, i didn’t have any oyster sauce, but tasted great, and using sirloin steak was so tender , thanks for this great recipe. Love this dish made it for my family last night.